Yes, you heard me well. Self-Sharpening knives! The first time I stumbled upon this phrase, I was unable to believe it as it sounded too good to be true. However, after conducting some research about this knife set, I was amazed to discover that indeed these types of knives did exist. With the advancement in technology, self-sharpening knives have become the norm thanks to their ability to self-sharpen every time you remove or replace the knives in their respective slots. Unlike the ordinary knives we have in most of our kitchens, self-sharpening knives are more promising as they maintain their sharpness for a long period of time. How long do self sharpening knife set last? I believe you must be wondering about the technology behind the best set of self-sharpening knives right? If we can go back to history, the most reliable and proven method of sharpening knife was by using a grinding stone. As technology advanced, more creative ways emerged where you only had to place a knife between two steel metals then pull the knife gently. Having gained inspiration from such traditional ideas, experts have managed to come up with more creative ways of making the self-sharpening idea a reality. What happens is that a strip of metal is fitted in the wooden block slots in a “V” shape to allow the blades fit in perfectly. When a knife is drawn or placed back, the cutting edge will tend to rub against the metal strip causing the blade to self-sharpen knives automatically. This is one question most customers have been asking themselves when purchasing knife sharpening set. In reality, self-sharpening knife tend to wear off much faster as compared to ordinary knife sets. You see, when the knives are removed or placed back into their respective slots, the inbuilt ceramic sharpeners tend to eat away a piece of the blade leading to thinning of the blades. After several years of use, this frequent self-sharpening mechanism will continue to peel off the blades causing the knives to last for just a few years. 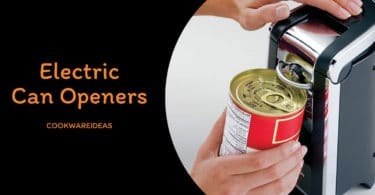 However, to compensate for this weakness, a majority of the manufacturers have opted to use high-quality materials to design the self sharpener blades to guarantee the longevity of the knives. Before making your way to any store to purchase a self-sharpening knife set, it’s advisable that you first do the math to avoid any future disappointments. Since the market has been overwhelmed with lots of different models and brands of knife sharpener to choose from, it’s advisable that you first consider these 5 factors before making a purchase. One of the basic factors you need to think of when choosing a self-sharpening knife is the type of blade. Although steel is considered to be the best choice, there are various types of steel metals involved among them being; carbon steel, stainless steel, and super steel. Depending on how you plan to use your knives, choosing one with a high-quality steel material (such as carbon steel) will help protect the blades from corrosion while still maintaining their toughness. Another factor you need to check on when choosing a self-sharpening knife set is the number of pieces. You see, knife sets mostly come with multiple knives that range from 4 pieces to about 18 pieces. Depending on how you plan to use the knives, it’s advisable that you first check the pieces carefully to ensure that what you get will be of great benefit to your kitchen. Another factor you need to consider when choosing a knife set is the weight of the blade. A light blade will most likely reduce fatigue when slicing while a heavy blade will reduce the effort making cutting and slicing a breeze. Depending on your personal preference, this factor will either make your cutting needs easier or tougher. Finally, we have the handles. There are various types of handles you’ll come across when selecting a self sharpening knife set. Among these handles include wooden handles, plastic handles, and rubber handles. Plastic handles are known to be durable while rubber/textured handles are known to offer a firm grip when cutting. If all you need is comfort, then consider purchasing those handles with an ergonomic design. Are you searching for the best knives sharpener that will maintain their sharpness for a long time? Well, look no further as the Sabatier Self-Sharpening Knife Block Set has come to the rescue. Unlike the ordinary knife sets, the Sabatier Self-Sharpening Knives are designed with an innovative technology that lets them self-sharpen the high-carbon stainless steel blade with ease. To ensure that the edges maintain their sharpness for a long time, Sabatier has used a ceramic material to design the sharpener. The Sabatier Self-Sharpening Knives come with a set of 12 pieces that will make your cutting experience a breeze. These knives are able to maintain their sharpness for a long time thanks to the ceramic “V” shaped sharpeners. These knives are durable and corrosion resistant thanks to the high-carbon stainless steel material. If cooking is your hobby, the Sabatier 12 pieces available in this set will be of great value when it comes to cutting and slicing. These knives are perfectly weighted and balanced giving you an easy and comfortable cutting experience. Although these knives are made from durable high-carbon stainless steel material, the blades have a tendency of breaking especially when exposed to tough cutting projects. The stainless steel holder is likely to peel off after some time. The sharpener doesn’t work precisely as you would have hoped it to. These knives are not dishwasher safe meaning you’ll have an extra task of cleaning them with warm water and mild detergent. As we conclude, let me mention that the Sabatier Self Sharpening EdgeKeeper Pro Block Set is one of the best knife sets to consider if you’re really planning to advance your precision cutting, slicing or chopping needs. The Sabatier self sharpening knife is crafted from a durable high-carbon stainless steel material, these knives are able to withstand the test of time while giving the blades an attractive satin finish. Recognized for the manufacture of top of the line cookware and kitchen appliances, Calphalon has released yet another set of knives known as the Calphalon Classic Self-Sharpening Cutlery Knife Set. Designed with an innovative SharpIN Technology, this set of self-sharpening knife is able to maintain the sharpness for a lifetime provided proper care is observed when cutting, slicing or chopping. The Calphalon Classic Self-Sharpening Cutlery set comes with 12-pieces that are already labeled for easy tracing. The blades of the Calphalon Classic are forged from high-carbon no stain steel which guarantees longevity, sharpness, and steadiness of the blade when cutting. The blades of these knives are balanced making it easier for you to slice, cut, and chop. The SharpIN technology allows these knives to maintain the sharpness for a long time. The high-carbon no stain steel material used in the construction means that these knives will last for a longer time. The handles are labeled and triple riveted for easy identification and comfort when cutting. Available with 12-pieces to choose from, I don’t think you’ll need to buy additional pieces. These knives tend to rust after some time. I think the best way to avoid this is by drying them entirely after every wash. The block doesn’t hold the knives firmly. A number of online customers have complained about the 8-inch bread knife which they say is missing from the set. In conclusion, the Calphalon Classic Self-Sharpening Cutlery Knife Set, a utility knife, is the way to go if you’re really looking forward to advancing your cooking needs. Featuring the SharpIN technology, you don’t have to worry about cutting or slicing with damp knives anymore. The high-carbon no stain steel material promotes durability while the overall performance of these knives is just outstanding. Next, in our guide, we have the Farberware Self-Sharpening 13-Piece Knife Block Set. Unlike our previous Calphalon Classic Self-Sharpening Knife Set, the Farberware features the EdgeKeeper technology that sharpens your knives gently to achieve the desired sharpness. 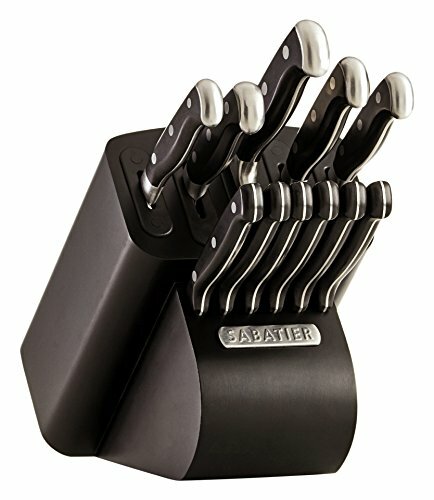 The Farberware knife set offers you a total of 13-pieces for versatility. Each Farberware piece is forged from high-carbon stainless steel material for durability and resistance to rust and corrosion. When it comes to storage, the Farberware knife set offers you a steady block that features an inbuilt ceramic sharpener for an easy self-sharpening experience. Although the manufacturer has offered you a lifetime limited warranty, ensure that you hand wash the blades with warm water and mild detergent to maintain its quality. These knives are made from a single piece thus eliminating the hassle of riveted handles. The EdgeKeeper technology used by the sharpeners ensures that the blades maintain their sharpness for a long time. These knives are backed by a lifetime limited warranty. This knife set offers you 13-pieces to choose from. The Farberware Self-Sharpening knives are light and very easy to use. The sharpening inserts have a tendency of falling off especially when pulling out the knives. Something else most customers have complained about is the quality of the blades which they say is prone to rust. These knives are quite dull and require extra sharpening to keep the blades razor sharp. 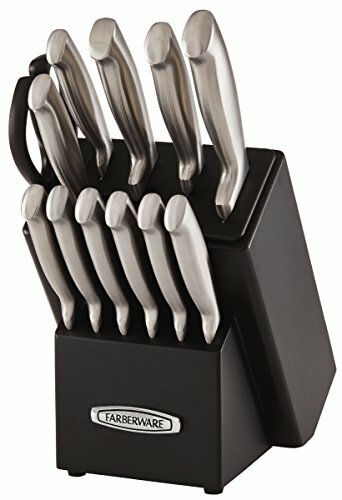 Finally, if you’re searching for the best knife set that will guarantee you quality and comfort, the Farberware Self-Sharpening 13-Piece Knife Block Set is the best choice for you. Featuring the EdgeKeeper technology, this knife set has an inbuilt ceramic sharpener on each slot making it easier for you to sharpen each blade. 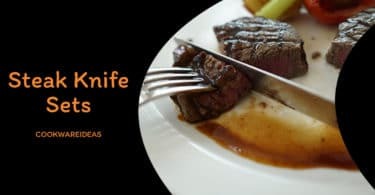 There are 13-pieces for you to choose from and the fact that each knife is a complete piece makes it easier for you to slice, cut and chop without any hassles. 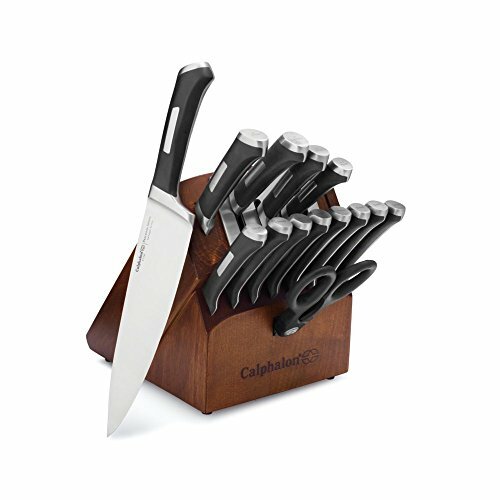 Next, we have the Calphalon Precision Self-Sharpening 15-Piece Knife Set. Also featuring the SharpIN Technology, this knife set is able to maintain the sharpness for a very long time. Available in a set of 15-pieces, these knives offer you every piece needed to accomplish various cutting, slicing, and chopping tasks. To maintain their sharpness, these knives have been fitted with ceramic sharpeners that rely on the SharpIN Technology to keep the blades razor sharp. The blades are made from a unique high-carbon no stain German steel material for added durability and protection against rust. The blades are strong and well balanced making it easier for you to cut or slice. The handles are labeled for easy access and feature a unique bar riveting for added comfort and durability. This knife set will offer you a maximum of 15-pieces to choose from. The unique bar riveting on the handles promotes longevity while still making the knives appear elegant and stylish. The SharpIN Technology ensures that these knives stay sharp for a lifetime. The tips of the handles are marked for easy identification. Most customers have praised the blades which they say are light and well balanced. These knives are not dishwasher safe. Some customers have complained about the quality of these knives stating that they’re made from China. Some knives do not rest evenly on the block. Finally, if you’re searching for a knife set that will guarantee you maximum comfort and versatility, look no further as the Calphalon Precision Self-sharpening 15-piece Knife Block Set is here to the rescue. Available with 15-pieces, this set is designed to fit evenly in the stylish walnut-stained hardwood block. The SharpIN Technology makes it easier for the knives to self-sharpen while the high-carbon no-stain German steel ensures that these knives stay for a much longer time without getting damaged. If you’re tired of buying low-quality knife sets every year, then I think the Chicago Cutlery 18-Piece Insignia Steel Knife Set will be of great value. Designed with an exceptional craftsmanship, this knife set offers you 18-pieces which are enough to meet all your kitchen cutting needs. The blades are forged from high-carbon stainless steel while the handles are made from contoured stainless steel for added durability and comfort. To keep the blades razor sharp, the slots are fitted with inbuilt self-sharpeners which sharpen the blades gently thanks to the exclusive Taper Grind edge technology. 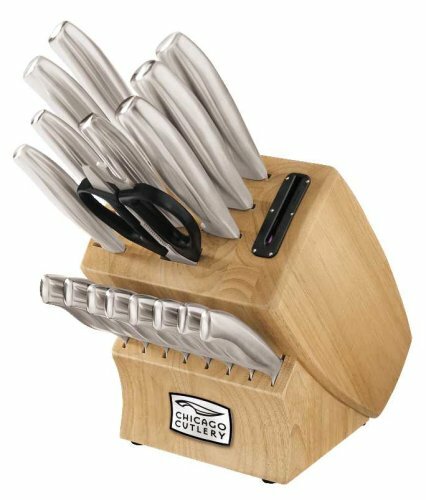 The Chicago Cutlery 18-Piece Insignia Steel Knife Set is backed by a full-time limited warranty. These knives are light and balanced thanks to the high-carbon stainless steel material. The Taper Grind edge technology ensures that these knives retain their sharpness for a long time. The 18-pieces mean that you’ll have a large variety of options to choose from when cutting different foods. These knives are surprisingly attractive especially when fitted in their respective slots. Although this is not a real con, some customers have complained about the light weight of these knives stating that it takes a while for you to adapt especially if you were used to heavy knives. Though it’s stated that these knives are made from high-carbon stainless steel, they’re prone to rust after several months of continuous use. The blades are not quite as sharp as you would have expected. Although most customers have complained about some areas, I think the overall performance of this knife set is just impressive. Available with 18-pieces to choose from, these knives are perfect for chefs and kitchen enthusiasts who spend most of their time preparing delicious dishes. The knives are light, razor sharp, comfortable, and extremely easy to use. If you’re searching for the best knives that will meet all your cooking needs, I don’t see the reason why you shouldn’t buy the Chicago Cutlery 18-Piece Insignia Steel Knife Set. If you’re searching for an affordable knife set for your kitchen or maybe to give away as a gift, I would recommend you buy the DEIK Classic Stainless Steel Knife Set. To begin with, DEIK offers you an exclusive set of 16-pieces which in my opinion are enough to outfit your kitchen. The blades are made from a premium quality high-carbon stainless steel material which promotes longevity and resistance to rust. Like it’s not enough, the manufacturer has designed these knives with a one-piece construction thus eliminating the hassle of dealing with defective handles. These knives are ergonomically designed for easy handling and are welcomed with a lifetime warranty to boost your confidence when making a purchase. The blades are very easy to clean though you’re recommended to use non-abrasive cleaners. The blades are razor sharp and very easy to use especially when cutting, chopping, and slicing. A majority of the customers have appreciated the matte black finish on the wooden block stating that it blends in with most kitchens. This knife set is available at an affordable price keeping in mind there are 16-pieces involved. The one-piece design means that you don’t have to worry about sticky food debris between the handle and the blade. The blades are light, weak, and prone to breakage. A majority of the customers have stated that these knives develop rust spots after several months of use. The overall quality of these knives is quite poor making them ideal for armatures and not professional chefs. 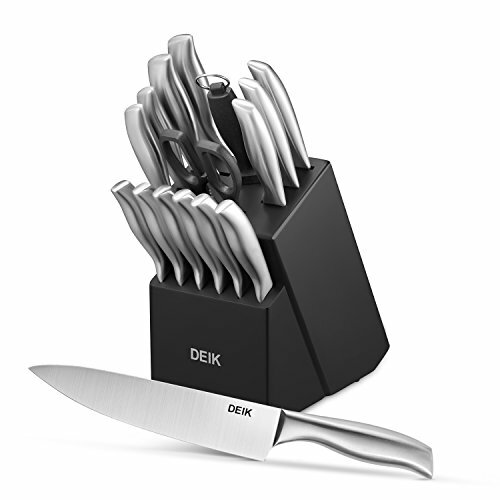 In my opinion, the DEIK Classic Stainless Steel Knife Set is an excellent choice for armature chefs, students or those customers searching for an affordable knife set. The set offers you 16-pieces to work with giving you the required versatility when conducting your everyday cutting, slicing or chopping tasks. Designed with a one-piece construction, I think these knives can really prove handy especially to those customers living on a tight budget. First, we had the Calphalon Classic then the Calphalon Precision. 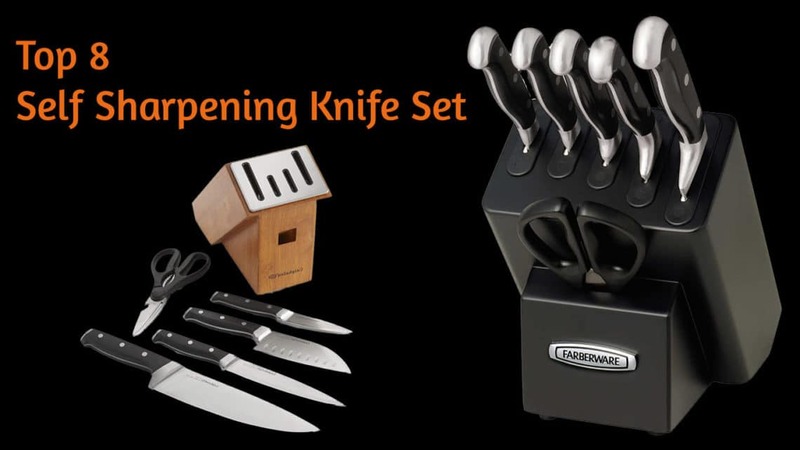 This time, we have the Calphalon Contemporary Self-Sharpening 15-Piece Knife Set. Available in a set of 15-pieces, these knives will give you the required versatility when it comes to accomplishing all your kitchen tasks. Forged from high-carbon no-stain German steel, these knives are able to stand the test of time while still accomplishing the self-sharpening idea with ease. The handles are labeled at the top for easy identification while the ergonomic design provides a perfect grip of the handles when cutting or slicing. These knives are solid and well balanced making them the best choice for professional users. The SharpIN Technology ensures that the blades stay super sharp for a long time. The knives are well labeled making it easier for you to select the desired pieces. This knife set offers you 15 exclusive pieces to choose from. Though expensive, these knives are also prone to rust especially after using them for a few months. The black handles drastically fade away after some time. To wrap everything up, I think the Calphalon Contemporary Self-Sharpening 15-Piece Knife Set is a high-quality set that will suit all your kitchen needs with ease. Designed with a stylish maple wood knife block and 15 high-carbon no stain German steel knives (though the steak knives are made from stamped Asian steel), this set is exactly what you need if you’re looking forward to upgrading your kitchen. Are you searching for a knife set that will save you ample space on your countertop? 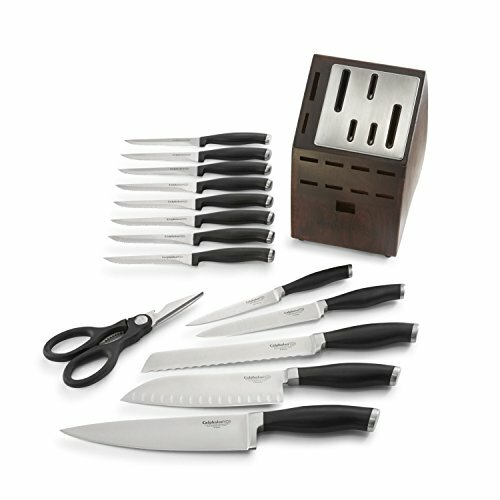 Well, the Calphalon 12-Piece Contemporary Self-Sharpening set might be your preferred pick. Manufactured by one of the best companies in the United States, this knife set offers you 12 exclusive pieces that will take your cutting, slicing, and chopping needs to the next level. Did we say anything about the blades? I guess not. Forged from high-carbon no-stain German steel, these blades are stable, durable, and extremely easy to self-sharpen thanks to the SharpIN Technology. Finally, the handles of these knives are contoured and well labeled to reduce fatigue and make it easier for you to select your preferred piece. Due to the heavy weight of these knives, less effort will be required when slicing, chopping or cutting. The block holding these knives is slender and perfect for people with small kitchen counter space. The built-in ceramic sharpeners ensure that the blades are gently sharpened anytime you remove or place back the knives. The labeled contoured handles are ergonomically designed to reduce fatigue when holding. This set offers you the proper tools ideal for every cutting requirement. The weight of these knives is not suitable for those customers who’re used to lightweight knives. The blades of these knives are not as durable as other competing knife set brands. 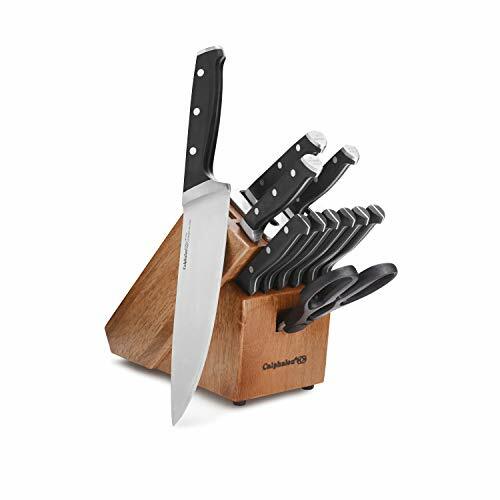 Overall, the Calphalon 12-Piece Contemporary Self-Sharpening set is a good knife set for those customers searching for a slender knife set to suit their small countertops. Designed with a self-sharpening SharpIN Technology, these knives are able to self-sharpen easily when removing or placing back the knives. Although the price of this knife sets are quite high for some customers to afford, the quality of the knives and the overall performance is what sets them apart from the crowd.